This time-saving guide shows the most common guitar and piano chords for every key you can play in. When chords are arranged this way, you'll often have all the chords for a single song on one page. No thumbing around for the chords you need. See a sample page here. Since it designed for guitar and piano you can use this guide to quickly translate chords from one intrument to the other. 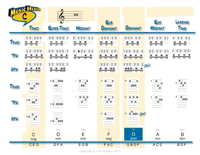 This guide provides quick overview of the most frequently used chords in music but for a deeper understanding of the subject of music theory, I recommend the "Down and Dirty Guide to Music Theory". It contains important material for people new to music as well as those who have been away from it for a while. This guide was originally written for and is featured on Music Hero, an online website for musicians who use their music to make a difference in their communities and the world. Sign up for the free Lotus Music newsletter and get great tips and other useful info along with the Music Hero "Chords by Key" guide. It makes looking up chords quick and easy and puts you on a path to better playing. This Guide is available free when you sign up for the Lotus Music newsletter. However, it is available without your subscription for $5.95. Click the "Add to Cart" button and you will be asked for your form of payment. 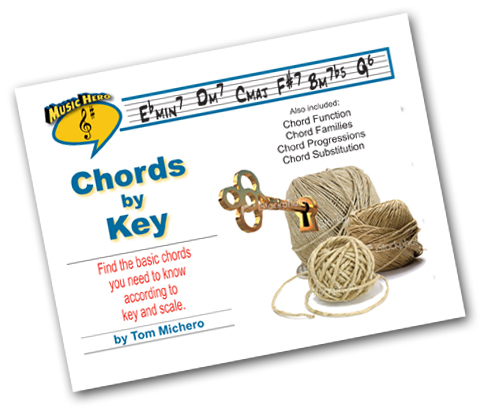 Upon payment you will recieve instructions for downloading the "Chords by Key" Guide.